Winter has arrived in Westeros, and I don’t know about you guys – but I can’t wait to see where this final season takes us. While our clan has pledged our allegiance to the King in the North, I can’t help but have some form of love for the golden House of Lannister. So, to kick off the last and final episodes, I wanted to share a Game of Thrones inspired cocktail, in their honor. 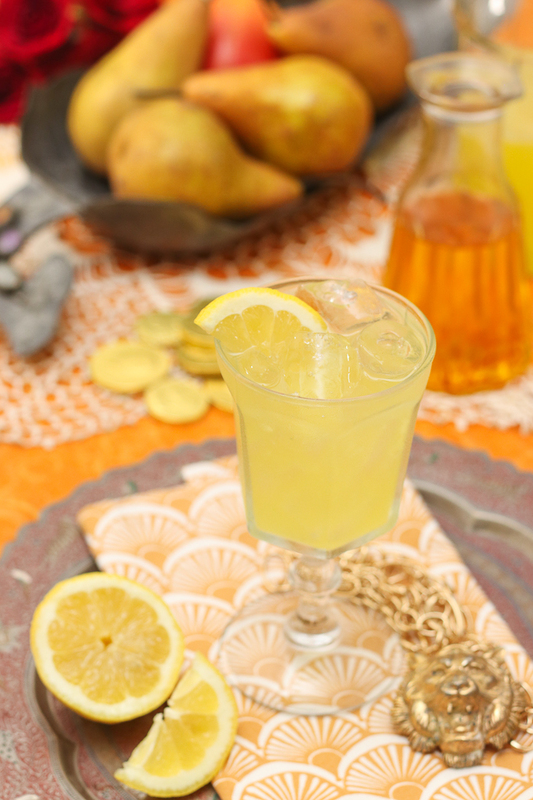 I think you’ll find that this saffron spiked lemonade is just like the fair-haired family of Casterly Rock. Golden and sweet on the outside, equal parts sneaky and sultry just below the surface – but at the core, sinister at heart. I know saffron is kind of a splurge. But, it’s great to have around in your spice cabinet – both for it’s subtle and unique flavor, as well as the rich yellow hue that it brings to the table. Also, cost be damned – a Lannister doesn’t worry about trivial things like price per ounce! A basic simple syrup is infused and steeped with with the red strands, then combined with freshly squeezed lemon juice and sparkling water, and a splash of vodka of course. It has been known to put the Queen Cersei into a golden haze on occasion, but lest she not forget: The North Remembers. And, the time has finally come for the Lannister’s pay their debts. For the saffron syrup, combine sugar and water in a small saucepan. Add the saffron and cook for 2 minutes over medium heat – until sugar dissolves. Remove from heat and let cool to room temperature. Place in airtight container and refrigerate for up to a week. Fill glasses with ice. In a pitcher, add lemon juice, saffron syrup, and sparkling water. Stir to combine. Pour into ice filled glasses and garnish with lemon slices.